Short Review: An excellent introduction to the crucifix, running through several entries, maintenance and dealing with your opponent's escape attempts, as well as a relatively comprehensive selection of submissions. This is all the more impressive given it is packed into thirty minutes. Each video is trimmed of any fat, leaving the essential details. Jacobs doesn't give you any guff: the longest section is barely two and a half minutes. If you're looking to expand your repertoire from the back, look no further. Jacobs is a superb instructor (who I can vouch for, having been to his seminar on the same topic). Thanks to this clearly structured and skillfully shot instructional from Digitsu, you can now experience that top notch teaching yourself, for a very affordable $16 (either on your phone or via the website, here). Be aware that it may not be live until a bit later today: I had access to a review version. 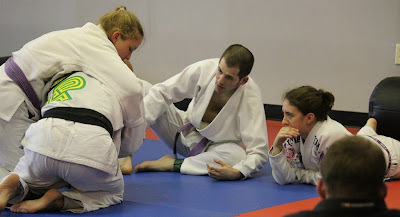 Full Review: The growth of online instruction has continued at pace in the BJJ community. For the last seven years, that has mainly been subscription websites headed up by big-name instructors, relying on a rapidly expanding technique database to keep customers paying their $25 each month. Digitsu has been around for a while, kicking off in late 2010 with an Abmar Barbosa DVD series, before living up to their name with several downloadable instructionals a few months later (headed by Stephen 'sambosteve' Koepfer, though as his online moniker indicates, those videos covered sambo rather than BJJ). Since then, they have gradually carved out a different space to the other major online BJJ hubs. Rather than relying on subscription, Digitsu has built up a selection of videos from a wide variety of instructors, offered on demand. Some of them are famous names, others are not as well known, but the diversity of positions, prices and styles makes for a compelling content library. Digitsu is also becoming the publisher of choice for instructors who aren't looking to set up a online instructional site themselves, but still have knowledge they want to share. For example, teachers like Karel Pravec, a veteran of BJJ forums for many years, has a product called 'Fluid BJJ' on Digitsu. A similarly stalwart forum goer can also be found in the Digitsu archives, or will be shortly after this review is posted: Dave Jacobs. 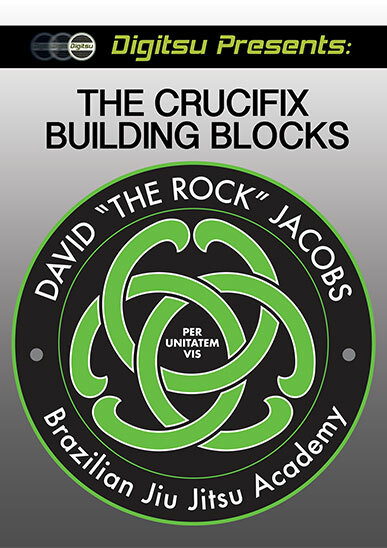 I had the pleasure of attending a great seminar with with Jacobs two years ago in Virginia, covering the crucifix. Since then, thanks to Jacobs lighting that spark, the crucifix has become my main focus from the turtle position. That was intensified by two crucifix instructionals I was asked to review, both again featuring instructors who are arguably best known because of their internet presence: Matt 'Aesopian' Kirtley and Nathan 'Levo' Leverton. Yesterday, Jacobs sent me a message asking if I wanted to review an instructional he was releasing via Digitsu. I jumped at the chance (deadlines are always good too: it needed to be up before Wednesday, so that got my lazy arse in gear ;D). Unusually for me, this is an instructional where I've essentially seen the material before, as almost all the techniques were covered during that 2014 seminar. In my case, this was therefore a refresher rather than lots of completely new stuff to play with. Jacobs style is concise, structured and clear, enhanced by the refreshingly pragmatic camerawork and editing by Digitsu. Although the entire instructional is only around 30 mins, Jacobs packs in 21 sections, each ranging from between one to two and a half minutes. There is absolutely no guff: every move and word is calibrated to be of use to you rather than filling in space. After the introduction (01:32), Jacobs gets into crucifix entrances, starting with the turtle (at 02:28, the longest video). The camera angle changes when Jacobs discusses different ways of grabbing the wrist, with a quick replay from a different perspective to show the leg positioning on their arm. Next up, there is an entry from deep half guard (02:11), one of the techniques which wasn't covered at the seminar. This looked interesting, especially as I don't do a whole lot from the top of deep half guard except try to underhook their arm. That's exactly where this entry starts, very handily. Drop your hip, move around, scoot under, then free your leg to get into the crucifix. I'm looking forward to trying this out: it should fit well with my scheduled lessons over the next couple of months, as I was thinking of looking at the back followed by half guard. Jacobs appears to have read my mind, because his next two entries (both a minute) are from positions I frequently use: first butterfly guard, then off the knee cut, my favourite pass. Finally, you can move into the crucifix after stuffing their single leg (01:05), varying slightly depending on how high they get their head as they shoot in. There is then a quick mobility drill (01:03), which I'll add in to the crucifix classes I'm planning to teach this month. Having shown the entry, Jacobs progresses to some positional pointers. A section on maintaining (01:21) emphasises the importance of head control, followed by what to do if you need to regain your grips (01:47). Jacobs also examines escape prevention (01:07), before he gets into methods for entering the standard face up crucifix (once you've secured the necessary grips from turtle). You can do a somersault to roll your opponent over (01:38), or the less acrobatic version I prefer, where you basically just walk backwards (01:17). This is the option that stuck with me from the seminar, which I've used ever since. The rest of Jacobs' instruction is dedicated to attacks, beginning with submissions from the kneeling crucifix (i.e., you haven't rolled them over yet). It is possible to lock (01:37) the arm you've secured, though I've always found finding the right point on the arm tricky. Jacobs has some additional tips he goes over in a 'fine tuning' segment (00:55), then it's into my favourite attack from the kneeling crucifix, a shoulder lock (02:06). I've taught this one as the 'dog pee' lock a few times now, for want of a better name. Looking at how Jacobs does it, I might be emphasising the dog peeing motion too much, as he seemed to bring his leg back a bit more rather than just straight out. I was expecting the clock choke (01:18) to be the standard version, as that's something I'll often try when I can't lock on the crucifix. However, it was instead a cool variation you can do once you've already got the arm secured for the crucifix, sprawling your hips down to apply the submission when combined with your collar grip. Naturally you also have the two classic crucifix attacks from the face up position too: the collar choke (01:21) and the armbar, listed as arm lock 2 (02:20) to differentiate it from the kneeling crucifix version. The kimura trap (02:01) is a useful what-if when they have managed to free their arm, or perhaps they've just gotten low enough that they could go for the back roll escape. Switch to a kimura on the arm you have underhooked, extending your arms out. This should prevent them from turning (but note it isn't impossible, the grip just gives you time). Walk your legs around behind them, then you can either go for the kimura as normal, or potentially re-establish your crucifix. From there, you could also slap on a wristlock (01:19). To conclude the instructional, Jacobs demonstrates what he calls a judo triangle (01:26). The finish looks similar to what I refer to as the step over triangle (although that starts from side control), particularly the version I saw in Scramble head honcho Matt Benyon's awesome video. Due to the angle and tightness of that triangle, it also gives you the option of applying a kimura simply by pushing on their arm, which is often stuck out vulnerably in front of you. Digitsu instructionals are available both through the website and their app, an important feature for me as I frequently watch instructionals on my phone. In either format, you can download them too, in case you want to watch them offline. There's a menu next to the video on the website, so you can skip to the segment you want. On the app, that menu appears below the video in portrait view, with an option to download next to each of the chapter headings (you can then view them in the app whether or not you've got a data connection). If you rotate your phone to landscape, the video automatically follows your lead, switching to fullscreen. For a mere $16 (available via Digitsu, here), this is more than worth it. That's currently discounted from $20 (about £13.50 at current exchange rates), but even at full price you're only paying a dollar per technique. If you've just started BJJ you might want to wait a while before jumping into this (though that's true of any instructional: I'd recommend beginners don't look into supplemental material for at least a few months), but the instruction on this is so clear that you're unlikely to run into any major problems. I've taught the crucifix to relative beginners before and they've all picked it up ok: it isn't necessarily as complex as it might look.